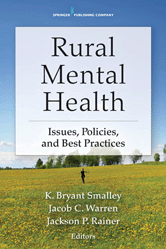 Addressing the needs of America's most underserved areas for mental health services, Rural Mental Health offers the most up-to-date, research-based information on policies and practice in rural and frontier populations. 7. Ethical and Professional Challenges of Mental Health Care Delivery in Rural Communities (or “A Day in the Life of a Small Town Psychotherapist”) - James L. Werth, Jr.